Afghanistan opium production, all-time high: Heroin ingredient farming widespread. A poppy field in Jalalabad province. According to the United Nations Office on Drugs and Crime (UNODC), Afghan farmers grew an unprecedented 209,000 hectares of opium poppy in 2013, surpassing the previous peak of 193,000 hectares in 2007. 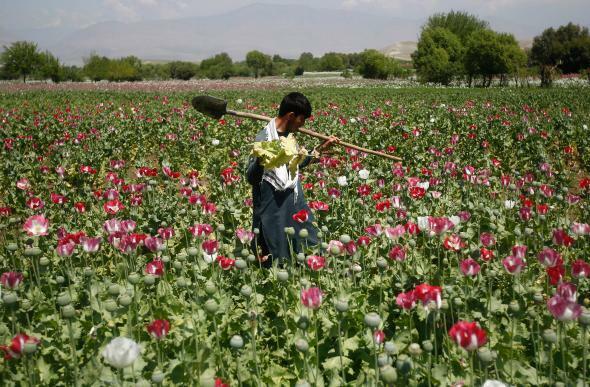 With deteriorating security in many parts of rural Afghanistan and low levels of eradication of poppy fields, further increases in cultivation are likely in 2014. To put those numbers in context, $7.6 billion over 13 years is about $585 million of counternarcotics spending annually on an area that is roughly as large and as populous as Texas (and has been occupied by as many as 100,000 U.S. troops). The United States federal government spends about $9 billion a year on domestic law enforcement activities related to drug control. Afghanistan was the world’s largest producer of opium before the American occupation and remains so now.